Discussion in 'New Members Say Hello' started by jcdammeyer, May 24, 2015. After posting today I realized that my first post was way back in October 2011. Then my Christmas lights were shelved and it's all been in a box until now. 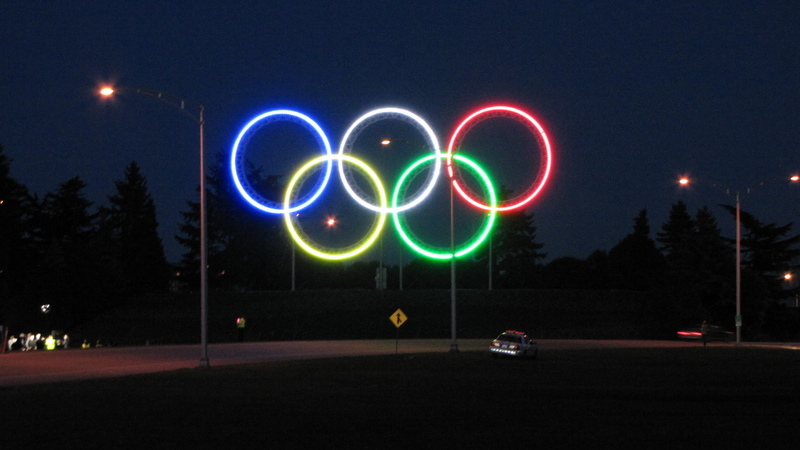 The reason for getting motivated again is because I was able to pick up a number of the RGBW lamps I designed back in 2009 for the 2010 Winter Olympic Rings at YVR airport in Vancouver. What made that project special is that we had two months to design a set of lights on rings. At that time there was nothing available on the market that would meet the design specifications. RS485 (and DMX) was not suitable for a number of reasons. I ended up designing lights that were on a Controller Area Network (CAN bus). A total of 744 lamps, each with 36 LEDs in clusters of RGB and W. Spaced far enough apart so that at the unveiling spot the lights would blend together into a solid line on an aluminium structure almost 5 stories tall. The LEDs used were 20 degree narrow angle Nichia in order to prevent spillage off the sides since the rings were roughly in line with Runway 08 at YVR airport. They were visible from the air on final approach above Vancouver Island. Control was done via USB to a Freescale 9S12 processor with 5 CAN channels. One for each ring. Although the project started with 100 lights per ring (within the CAN spec of 120 nodes) the venue and viewpoint was changed two months into the project requiring 150 lamps per ring. That exceeded the 120 node value so a CAN bridge was added and the rings split into segments of 50 RGBW lamps per segment. Bit rate was initially 1Mbps although some segments were later modified to run 500kbps. We were right on the 35m edge of max distance. Refresh of all lamps was done at a 24Hz. PC Software was written in Delphi specifically for the rings. Show sequences were stored in XML files. 1. The 9S12 controllers with 5 CAN bus channels and a WizNet module. I've written E1.31 software for that. 2. The lamps have PIC18F series processors and a connector for RS232 or RS485 modules so I have a lamp without LEDs that receives a DMX512A packet and turns it into CAN messages for 100 lamps (RGB+W+I) per lamp. 6. I have an LOR 16 channel Triac controller and have used Light-O-Rama 2 for Christmas shows 3 years ago. 7. Also in the bundle is an LOR to DMX1000 converter. In the works is a small DIN rail box that can take DMX512A RS485 in and send out CAN or the protocol for the GE-35 Christmas lights of which I have 8 strings of 50 lamps. I did write software for a dsPIC 4012 proto board to run a string of 25 lamps. The RGB control with E1.31 was all done with Vixen 2. I'm now considering upgrading to LOR3 since I'm finding Vixen 3 hard to work with. That's about it. Too many projects. Not enough time. Very nice work you did there. I may have experience at the low level embedded systems but running the show software leaves me somewhat baffled. The Olympic Rings software was written by a friend who unfortunately succumbed to Cancer before we even started the double set of rings. I wrote the PC based diagnostic and control software. He wrote the show software. The bi-directional CAN bus allowed us to monitor lamp temperatures and voltage. One summer day the temperature hit record highs by the Vancouver airport and lamp temperatures (even though the LEDs were off) reached 60C in some. The attached photo shows a screen with the temperature information. Blue is cold and red is added as the lamps warm up. I really wish I'd captured that hot day though. It was pretty impressive. I have questions on how to use Vixen with RGB light strings. I'll post there with my questions. Vixen 3 I think you will find easy once you get a handle on the separation on lighting object and patching to the controller object. Feel free to ask away we have quite a few Vixen3 experienced experts here.